Shortly after I moved into my flat in Singapore about a year ago, I found out that right in my “back yard” a 70-story skyscraper (Altez) was breaking ground. I guess most people would be a little put out that their view is getting blocked, but actually I was quite excited (although, it was also interesting to watch the formerly visible shipyard load ships). I find construction sites to be fascinating and educational. However, I don’t have the time to just stare out my window all day, so with a little help from xobs I modded a chumby One and added a USB camera to it, and created a script that snaps a 1280×1024 jpeg of the scene once every 15 minutes. All that data is collated on a NAS and finally encoded into a viewable video using mencoder. The construction has finally progressed to a point where “interesting” things are in sight, and I’m sharing the video in case you are also fascinated by construction sites. I’ve learned a few things, such as what those dimples are for on the internal pillars of tall buildings (they hold the scaffold in place as the building goes up), and that red thing at the top of the building is for pumping concrete flooring. Also, toward the end of the video you get an idea of how much the crane’s mast flexes during normal operation. Support Aaron Swartz by signing the on-line petition. Yet another abuse of copyright law. I don’t know anybody who is fond of JSTOR. It’s a shame that here in the future, bodies of work built on a substantial amount of public funding can have such high barriers of access. I feel that barrier especially now that I’m out of academia; it’s very hard for me to do literature searches without paying an arm and a leg. Fact of the matter is that academics tend to be law-abiding citizens, but who makes the law, and is it right? Without asking questions or raising challenges, they are herded like sheep to be shorn. Kudos to Swartz for putting himself out there and taking the charge against the status quo. The Ware for July 2011 is shown below. Click on the image for a much larger version. It’s the summer of retro wares! The ware for June 2011 is shown in context below. 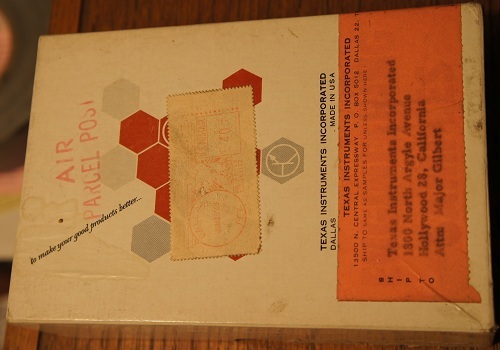 “To make your good products better…” with a post mark of June 25, 1963 and addressed to Major Gilbert. Cave Johnson would be proud. 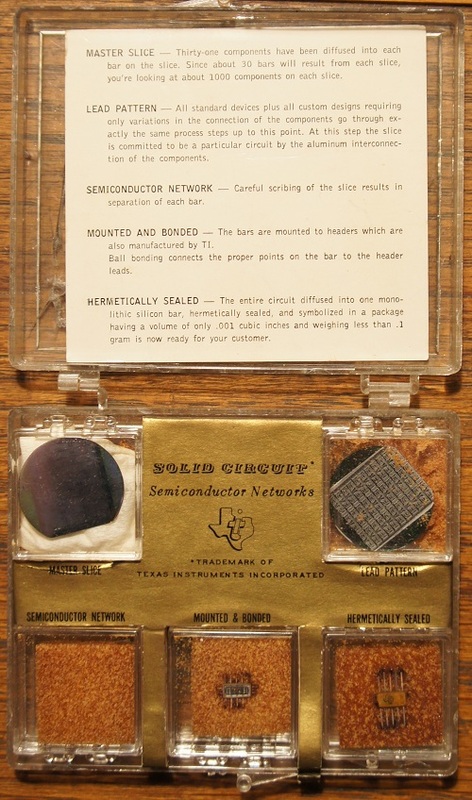 This sales kit was mailed just two years after the introduction of commercial integrated circuits. Neither the box nor the packaging reveal what the part is; this is just a generic sales kit to educate engineers about this fabulous new “solid circuit semiconductor networks” technology (“SCSN” doesn’t roll off the tongue nearly as nicely as “IC”, although perhaps that’s what the SN stands for in the TI part numbering scheme for small logic devices). This makes judging a bit difficult. 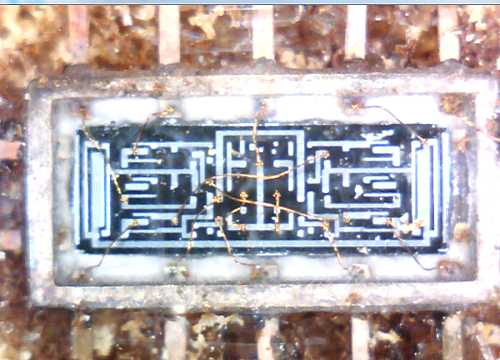 My best guess is that this is a series 51 RCTL type chip. My initial thought was that it’s a dual 3-input NAND/NOR gate (SN514), due to the symmetry and the pattern of three similar devices on each side, but some of the readers pointed out that the crossed internal wirebonds could be indicative of a flip flop. The internal wirebond pattern is curious; certainly, it’s not unreasonable with just one layer of metal and diffusion for routing to call for internal wirebonds to assist with power distribution routing. It could be the case that it’s a 6-input NAND/NOR gate (SN513), where the construction is based upon the same diffusion pattern as the 3-input NAND/NOR gate, and the internal wirebonds are used to tie the necessary nodes together to put the transistors in parallel between the two half-circuits (which would be a way to make two part numbers from a single chip). This is a rare ware which, at the conclusion of the contest, we still do not have a definitive answer as to its function or part number. Exercising my full right to be arbitrary in judging, I declare f4eru as the winner, because I found the links provided to be very helpful and interesting while researching the answer, particularly the compilation of retro circuits made by NASA. Congrats, email me for your prize! The Ware for June 2011 is below. This one should be tougher than last month’s ware. This work by bunnie is licensed under a Creative Commons Attribution-ShareAlike 4.0 International License.